Thanks! Took me awhile to settle on the numbers, and I haven't measured the angles since the frame was built. Steve and I were talking about a 69-degree HT and a 72 to 72.5-degree ST. 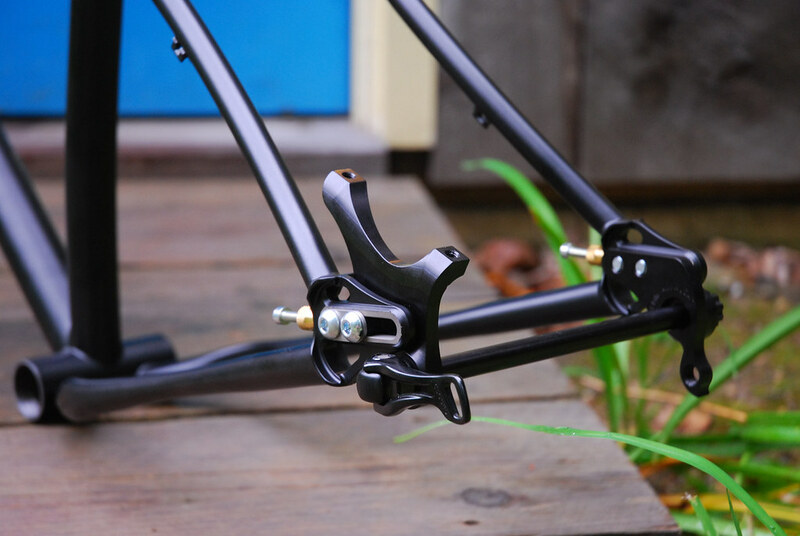 The fork is a 130mm, but the frame was designed around a 120mm. I have it set up with a bit more sag than usual, and (wow!) it rides really well as-is. If/when I get a new air spring to reduce the travel, I'll also move the rear axle forward in the dropouts for increased friskiness...we'll see. BTW - the enduro bike you built looks awesome! I'm currently in the market and looking at production bikes, but haven't settled on one yet. 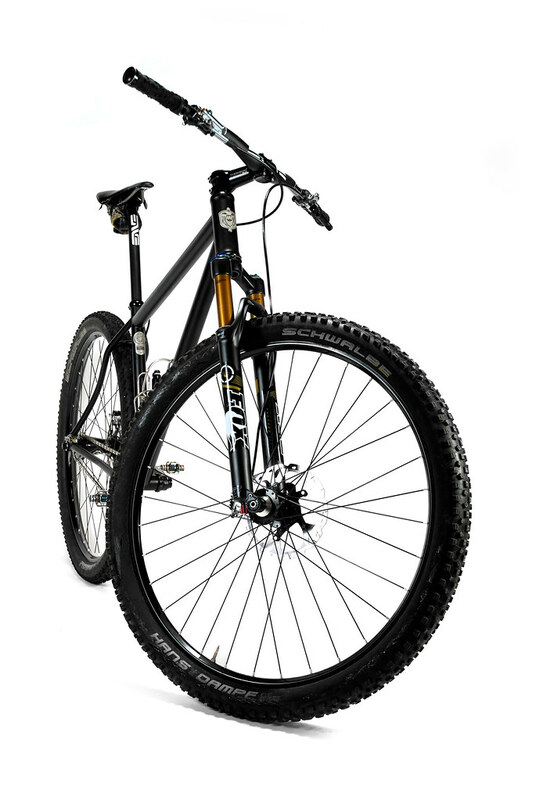 Possibly a Trance/Bronson @ 650B, or Ripley/Atlas @ 29er. 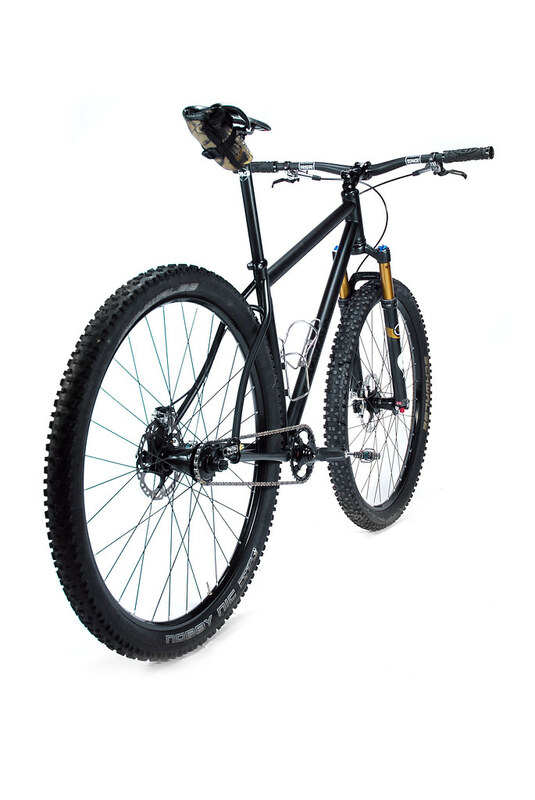 You like the 650B? What sliders are those? Don't think I have seen TA sliders. What did you have in there before? The sliders are Paragon Machine Works Hooded Sliders, with their Ti Bolt kit hop-up kit, and their Shimano style SS 12x142mm dropout inserts (post mount for the non-drive side as well). The hub is an older I9 Classic hub, and the axle conversion was really simple. The newer version (Torch Classic) just requires an end cap swap I believe. This older style required an actual axle swap and drive side spacer swap. I love PMW's sliders as it pretty much has an option for every axle, brake mount and hanger style available. I really like those El Mariachi's. Had that frame been available when I built up my SS, it's what I would have used. Some updates to my Ragley TD:1. Added a top cap that a friend made a prototype of for fun. Added some 2012-era XTR brakes and mated them with Hope floating rotors (this involved a lot of filing to get it to work with the Pace RC31 fork). Added some skinwall Onza Canis tires. I can't understand the amount of F/S bikes here though. You can rip on the trails around here with a hardtail (front suspension or not). I took a setup like this to Moab and Fruita. It was still amazing. I guess anything with big drops and a ton of rocks is where its not going to work so well. I've only ridden Burnaby Mtn once, but a rigid single speed still wouldn't be the great choice. When I think "rigid" bike I picture endless miles of this above. There is plenty of that back in Ontario. Out here I have to drive many hours to get to it. With Fromme only about 5 blocks of pavement/gravel paths from my house it's hard to ride anywhere else. quick grab when I was almost finished building it a few weeks ago. Got a Moots setback post in it now. Fun bike. I like 650b. I can't understand the amount of F/S bikes here though. 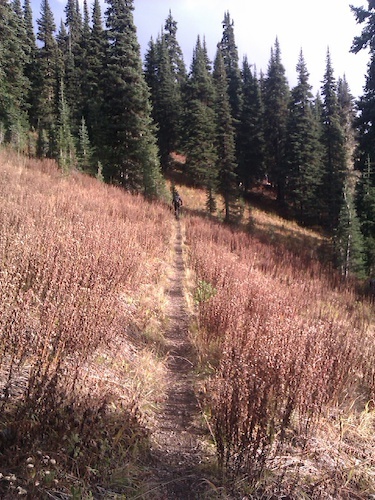 You can rip on the trails around here with a hardtail (front suspension or not). Love those skinwalls!! Maxxis is making the Ardent in a skinwall now, if they'd make an Ikon too I'd be set! Thanks. Always liked the look of them. These are replacing my Racing Ralphs for now (which I absolutely love, so there is a good chance I may swap them back for racing season depending on performance). The tread on this is somewhat similar. The Ardent's look awesome but were a little aggressive looking for the trails around me. Excited to see these big gumwalls. Might just treat myself this Christmas and replace my 7 yr old Nanos with a pair of Onzas or Ardents that'll hopefully get me through the woods for another 7 years. Messed about with a long exposure earlier - Used a CREE LED front light on low power to paint-in the light. This is my refinished Vicious Cycles 29er. It was bought used and battered and I rode it that way for a year until I knew I liked it enough to repaint. I also upgraded the parts from a mix of first gen XTR (soooo beautiful) to latest gen SLX (sooooo functional! ), rebuilt my XTR hubs with Pacenti rims and did a powder coat/ vinyl decal repaint. I kind of regret not splashing out for a wet repaint and proper decals under clear coat, but I went cheap - oh well. Carl at Vicious blessed it with his new and fancy copper head badge that now adorns the HT - nice! The new rims and possibly the tubeless setup has pushed the rear tire closer to the chain stays, so I have just a few mm on each side before the tire rubs. Maybe I need to get a skinnier rear tire, but for now I will stick with the 2.2" Conti. I took it out this AM for a few hours and had many a smile. I don't ride MTBs much any more, but won't consider selling them, as they are such a blast to ride every once in a while. Here's my 2001 Steelman Manzanita. 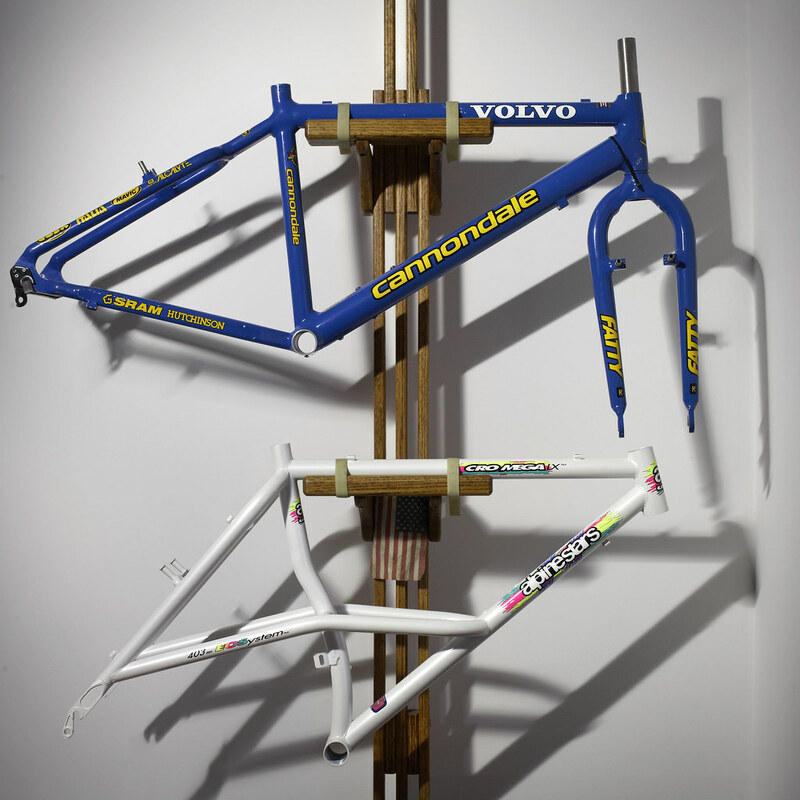 I had Spectrum refinish it in 2011, and replaced the original fork and brakes then, too. Still rides great, but at times I am itching to try a bigger wheeled bike.